A couple of years ago, I briefly mentioned K's love for HeroClix, a tabletop strategy game involving tiny superhero figures (although not always). I should clarify: it's not really a love, but more like a "gotta catch 'em all" kind of obsession. That's right, K's a collector. 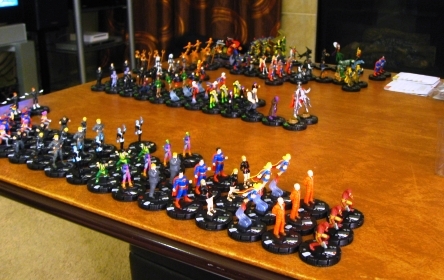 Since the game's inception in 2002, K has purchased every single set and conservatively owns 3,500 figures. So the reason why I haven't written a lot about video games recently is because K's video game spending has gone waaay down (a whole other topic) and NECA has been releasing new HeroClix sets at a higher frequency. He spent this past weekend unpacking his latest set, pausing every once in a while to show me a particularly well-done sculpt. And I hate to admit this, but I have absolutely no interest. They cost a lot of money and time (for sorting and selling). I have no interest in comic book characters. They take up a significant amount of space in the house. Do you support your significant other's gaming habits or not? Actually, K's parents came over for dinner last night, and even after 2 hours of cleaning clutter, there were still armies of HeroClix occupying our dining table. Haha, what a sight it must have been for them! I support my bf's habits most of the times because I have close to the same habits! lol! However sometimes he does get to points where he is playing all day, day after day. Usually he gets out of that phase on his own but sometimes I have to remind him about other things in life lol. We really are lucky though...We both enjoy mostly the same geeky things so there is an understanding for each other in that area. 2) Those things come in separate parts so he have to assemble them with glue AND paint them. Landelf, you DO know how I feel!! I'm so thankful K's not into Warhammer because it's far more time-consuming than HeroClix. O_O Have to give him cred though; K's been in an eBaying whirlwind recently to make more cash while he's out of work. I think he might even offload his light saber collection! Hubby restricts his RPG-playing to one night a week with his buddies. There are far worse things he could be doing in far more unsavoury places on a Friday night so I have no problem with that aspect of his gaming life. I do wish that he would sometimes spend less time with his MMO and more time with me some nights. Thankfully we are not into Heroclix or Warhammer around here. Our three kids have too many toys. We don't have room to add any more! Money and space wise, he has his own room dedicated to it (I keep the door closed when he's not here so I can't see it scattered across the four corners of the globe) and he has a good knack for finding deals online and trading with other players to get his plastic crack, as they call it, as cheap as possible.